Standardized work (STW) is fundamental to the Lean Business System. What's the best way we know - right now? How do we summarize our current best way one, simple, visual page? How do we engage our team in continuing to improve our best way? Embedded tests that signal Good/No Good are also critical. Does this recipe apply outside the factory? The embedded tests concept applies universally. As for the other elements - yes and no. Yes - in short cycle time, repetitive knowledge work e.g. a pharmacy or laboratory analyzing high sample volumes. No - in long cycle time, non-repetitive knowledge work e.g. a surgery, engineering or design process. STW confers all its customary benefits - if applied with finesse. A good example is the Checksheet - which is simply a list of embedded tests that tell us whether we're okay or not. 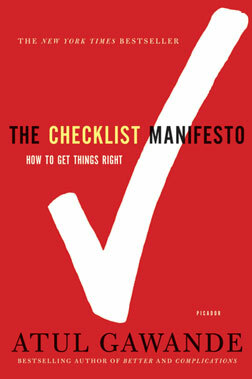 Atul Gawande's fine book The Checklist Manifesto illustrates how we might apply STW to knowledge with finesse. Translation will be vital as we move the profound Lean principles upstream & downstream of the factory, and into entirely new field of work. The worlds awaits Lean thinkers with finesse. I certainly understand how STW would not apply to non-repetitive work, but not sure why the difference between short- and longer-cycle work. Let me clarify. The principles of STW apply to both short & long cycle time work. But the content-sequence-timing-expected outcome recipe needs to be applied with finesse in knowledge work. For example, a surgeon, interogating lawyer or design engineer, may NOT always follow the same content, sequence or timing in every case. If the surgeon, for example, discovers a tumor or some other abnormality, she'll alter the content, sequence & timing as required. Gawande's Checklist Manifesto illustrates how we might apply STW with finesse.